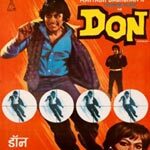 "Don" is a 1978 hindi film which has Amitabh Bachchan, Zeenat Aman, Helen, Kamal Kapoor, Pran, Iftekhar, Om Shiv Puri, Shetty, Mac Mohan, Satyen Kappu and Jairaj in lead roles. We have 5 songs lyrics and 5 video songs of Don. Kalyanji and Anandji have composed its music. Asha Bhosle, Kishore Kumar and Lata Mangeshkar have sung these songs while Indeevar and Anjaan have penned its lyrics.